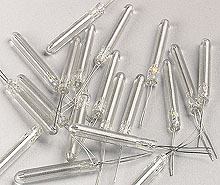 Glass wire wound platinum RTD elements are made by winding a platinum wire onto a glass core and then fusing the exterior with glass. They are suitable for low or very high temperatures and are tolerant of thermal shocks. They offer good vibration resistance (depending on mounting method) and can be immersed (with exception of GX) directly into liquid media. Nota: The Glass wire wound platinum RTD “GN” Series has a platinum band wound into a solid glass core and homogeneously fused with the exterior glass.